Here in Pennsylvania the weather has been SUPER cold and snowy! We've already had two snow falls and are expecting another one this weekend. I'm enjoying it so far because last year we hardly had any snow at all. The snowy weather has certainly put me in the mood to decorate for Christmas!! As I mentioned in one or two project posts this year I wanted to decorate with light blue and gold to go better with our new paint in the family room. It took a little finagling and standing back and going hmmmmmm and running out to Target to spend MORE money on MORE Christmas decorations but I really like how my floating shelves turned out now :) I think they have a nice classy/elegant feel that maybe comes from the fact that there is NO red or green anywhere up here haha. But hey! Who says to be festive you must decorate with red or green??? 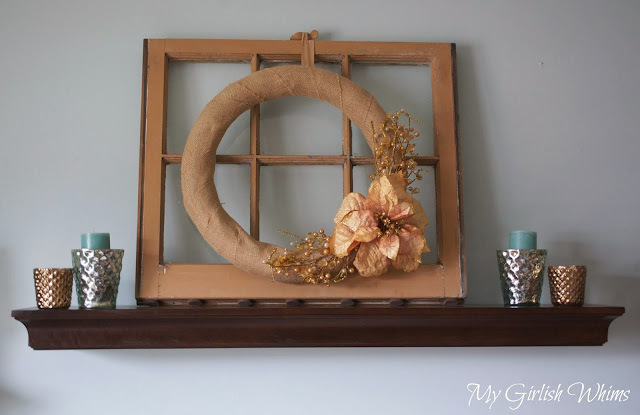 The focal point of the shelves is my old window pane with a pretty DIY wreath hung on it! I will have a quick tutorial posted for it soon :) At first I was a little sad to not bring back my winter pearl wreath from last year after I spent SO much time making it, but now I'm happy to switch things up - I really like this new wreath too! I finished off accenting this shelf with light blue and gold candle holders from Target. My next shelf is my Christmas tree village! 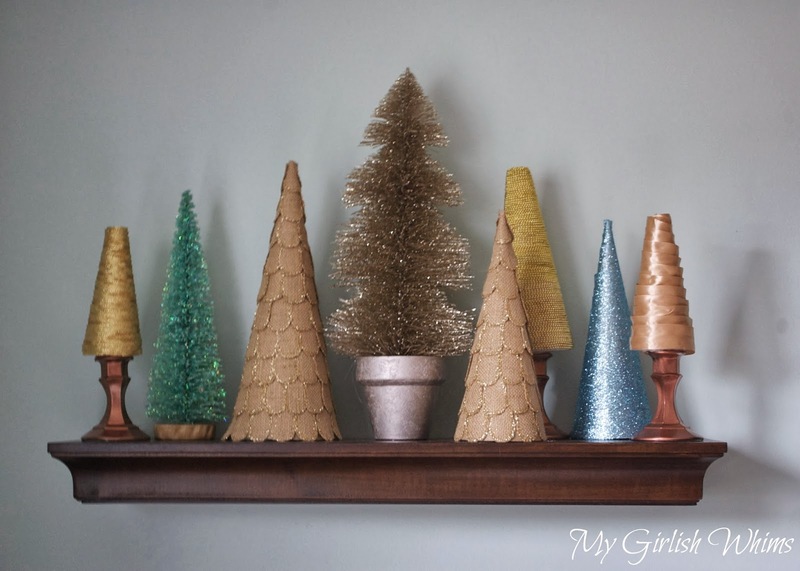 I brought back my mini gold christmas trees from last year and added some more including my newly made burlap and glitter Christmas trees. The center big sparkly tree is from Target, as well as the smaller blue tree on the left. The blue tree on the right I made real quick by hot gluing sparkly ribbon around a cardboard tree base because I need a little more blue in the village! Then my last little shelf has my newly made DIY Most Wonderful Time of the Year sign and another gold tree from Target. (Anyone getting a sense for the store that I spend the most money at???? Oh Target you are my downfall). 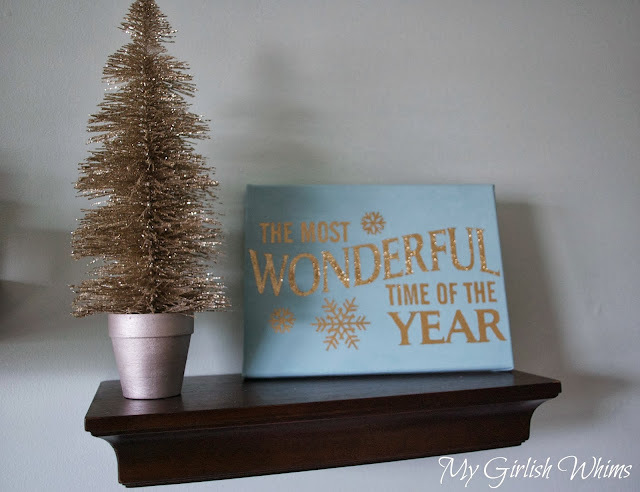 It's funny how something so simple as festive floating shelves can make you feels so festive every time you look at them :) Merry Christmas!!! I like the neutrals...and of course the sparkle.